Welcome to my real estate website! 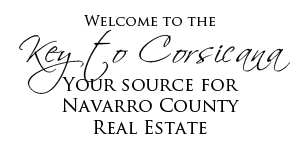 On my site you will find everything you need to know about buying or selling a home or property in Corsicana, Richland Chambers Lake or surrounding communities. I am dedicated to providing the finest real estate services available whether you are looking for land, commercial or residential, resale, new homes, condos, golf course, pool or tennis communities. Contact me if I can assist you with your search!